Hi there! Still with me? YAY! Last but definitely not the least, I would like to show you a gorgeous new collection from Barielle--the Keys collection for Summer 2014! 6 gorgeous, bright shades just screaming out for summer! Love them all! NEW YORK, NY (SUMMER 2014) —Barielle’s Summer 2014 “Keys Collection” celebrates the warm, sun-filled, tropical beach days enjoyed all over the world. These beautiful, creamy, high-fashion colors set the mood for paradise vacations. 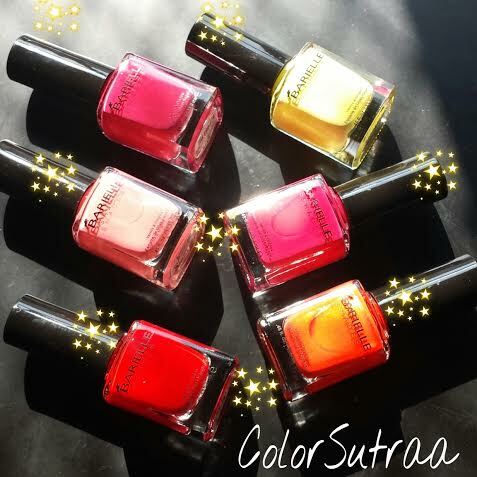 SHADES BY BARIELLE: Formulated to provide nails with safe, healthy and long-lasting glossy color coverage. Shades by Barielle is free of formaldehyde, toluene and dibutylphthalate. Women can also safely use Barielle products during pregnancy. KEY FEATURES: Contains no formaldehyde, toluene, dibutylphthalate, camphor or formaldehyde-resin. So there you have it, my darlings! These beauties have already winged their way to me and here's a little glimpse of them in full sunlight! Which of do YOU like best? I'd love to hear from you in the comments section below! I'd like to try Barefoot in Bermuda and Paradise in the Tropics.